Speaker Karu Jayasuriya should take full responsibility if his opinions, aired with political bias and at the request of one political party creates political instability or unrest among the public, the Government stated yesterday. The Government also expressed its dissatisfaction over the Speaker’s attempt to create unrest and instability in the country by acting beyond his powers. Commenting on the statement issued by the Speaker that he is compelled to accept the status that existed previously, Foreign Minister Dr. Sarath Amunugama said that by issuing statements, the Speaker has demonstrated personal and political bias, adding it was an undemocratic and an unconstitutional move. He said that even if all 225 MPs had signed a letter, the Speaker cannot convene Parliament. Minister Amunugama said it was very evident that the statement made by the Speaker was totally biased and that the Speaker has no power to reconvene Parliament and it is violation of the Constitution. “As Speaker he should remain neutral. He cannot issue politically biased statements. The President did not violate the Constitution or the law,” he said. Dr.Amunugama emphasised that the President prorogued Parliament in order to provide ample time to prepare the 2019 Budget since they needed time to prepare a practical budget unlike the previous Yahapalana Government. He said the Speaker does not have any powers according to the Constitution to take a decision on convening or proroguing Parliament. “The Speaker does not have any power to decide who should sit in the Prime Minister’s seat. That is a decision taken by the President. No provision in the Constitution says the President has to consult the Speaker to appoint a new Prime Minister,” he explained. He noted that nobody can run a Government based on political gossip initiated by some people and added that the personal views of the Speaker should not be taken into account when taking decisions on Parliamentary proceedings. Ports and Shipping Minister Mahinda Samarasinghe said that even if all 225 MPs had signed a letter, the Speaker cannot convene Parliament. He said it was very evident that the statement made by the Speaker was totally biased. 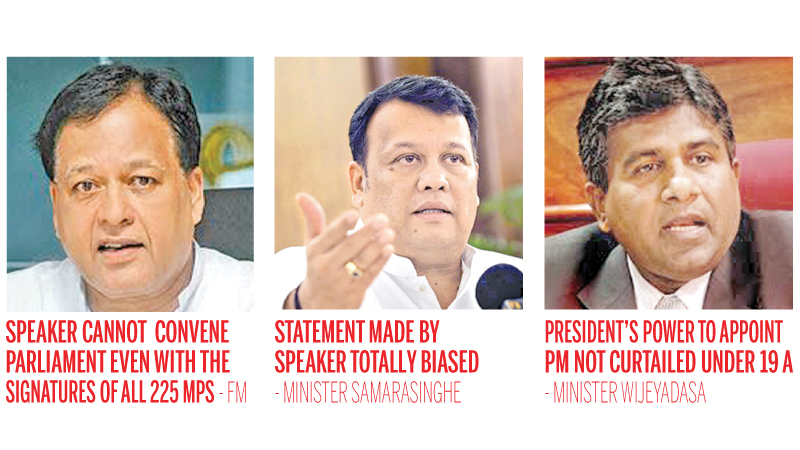 Minister Samarasinghe said it was ethically and morally wrong for a Speaker to act in this manner. “The Speaker unofficially arranged three meetings at the Parliament complex and insisted that a majority had signed a document emphasising that the Speaker should convene Parliament. He should act in accordance with the Constitution,and not according to his own whims,” he said. He said that even after the February 10 Local Government Elections, the President prorogued Parliament. 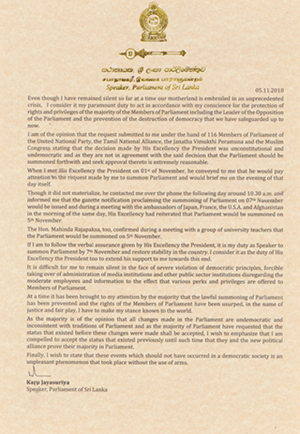 Minister Samarasinghe said that it was unethical for the Speaker to issue this statement on the same day that the President issued the Gazette to convene Parliament on November 14, two days earlier than the previously scheduled date of November 16. He requested the Speaker to respect democracy and the Constitution. Education and Higher Education Minister Wijeyadasa Rajapakshe said the President’s power to appoint the PM according to his will was not curtailed under the 19th Amendment to the Constitution. He said that when Ranil Wickremesinghe was appointed as the Prime Minister in January 2015, he did not have the majority support and it was President Sirisena who made the decision. Minister Rajapakshe recalled that nobody protested over that decision made by the President. “The Government is going to present the Budget next week and if they want they can defeat the budget,” he said. He further emphasised that under Section 70 (3) of the Constitution, the President has powers to prorogue and convene Parliament. Minister Rajapakshe said the Speaker might have to take full responsibility if any unfortunate incidents happen as a result of his actions. MP Thilanga Sumathipala said that as a former Deputy Speaker, he was disappointed by the statement made by the Speaker of Parliament. He further said that it should have been a smooth transition and added that it was an illegal move by the speaker. MP Sumathipala said that even the employees are in a difficult situation as a result of the Speaker’s statements and activities. He noted that the Speaker is standing as a barrier to the Parliamentary proceedings. “Standing Orders cannot be changed and each one of us is bound to respect and follow the Constitution”, he said. MP Sumathipala said that the Speaker is trying to create instability through his actions. Foreign Affairs Minister Dr. Sarath Amunugama responding to the question raised by a journalist about the interpretation of the Constitution, said that only the Supreme Court has the powers to interpret on the Constitution. He further said that Ranil Wickremesinghe has not chosen to go through that procedure.